Western’s first Mariachi Conference will feature student mariachi musicians from throughout the state in a free concert in the Performing Arts Center Saturday, April 14 at 7 p.m. The conference will feature Mariachi Bahia Azul de WWU, Mariachi Quinto Sol de UW, Mariachi del Centro from Central Washington University, Mariachi Imperio Real from the Wenatchee area and the mariachi band from Burlington High School in Skagit County. 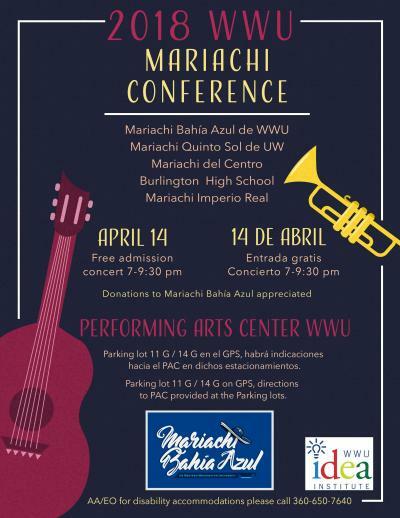 The event is organized by WWU students Juan Galvez and Jessica Alvaro, both leaders in Mariachi Bahia Azul de WWU. Galvez is also a WWU IDEA Institute Changemaker Fellow whose fellowship has focused on promoting mariachi music, which he sees as a powerful tool to get people excited about Mexican culture while providing a welcoming place for people to explore and share their heritage.